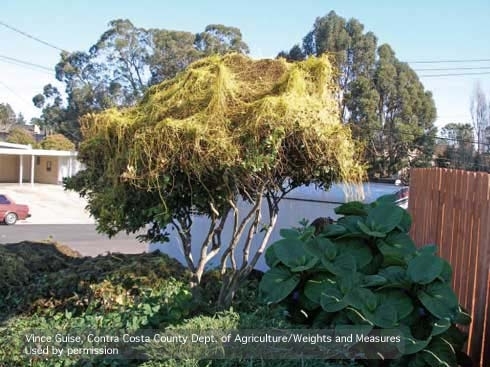 There are several species of dodder native to California but they are not as problematic as a particularly invasive species, Japanese dodder, Cuscuta japonica. This invasive plant pest has thick stems that resemble spaghetti. It grows larger and faster than native dodders and can even cover entire trees or shrubs. Japanese dodder is spread when pieces of it are broken off and moved about by birds or other animals. It can also be spread through human activities such as pruning, composting, and the improper disposal of infected plant material. For more information about Japanese dodder and other dodders, consult the Pest Notes: Dodder.